We had no intention of touring a mansion during our visit to Newport, RI this summer, but it ended up falling on our agenda regardless. The last morning of our weekend, we packed a cooler filled with a picnic lunch, and headed off to the famous Cliff Walk. Our goal was to sit and watch the rolling waves after we got in some exercise. But, about 20 minutes into our walk, we discovered a barrier ending the path early. The sign indicated the Cliff Walk was closed “beyond this point” due to storm damage, up to Ledge Road. Disappointed, yet determined, we backtracked to our car, and drove up Bellevue Avenue to locate the Ledge Road entrance, so we could continue our walk beyond the damaged areas. Finding Ledge Road was easy, however, we discovered there was no public parking near that entrance, only private street side spaces. We drove back up the end of Bellevue Avenue considering what to do next. It was then I noticed beautiful and full Hakonechloa grass by a gated entrance. I wanted to take a photo of the grasses because it was such a great example of how to use them in the landscape, so I asked Steve to slow down. That moment lead to us entering the premises, marked “open” by a flag near the entrance gate. The friendly man at the gate told us a tour of the mansion on the property was about to begin in a half-hour. With nothing else on our backup plan, we got tickets to join the tour. This was the last mansion on the famous Bellevue Avenue strip, called Rough Point – and maybe one that is overlooked since it is last on the strip. I know we wouldn’t have bothered if it wasn’t so convenient as our next adventure of the day. As we drove into the parking area, we both noticed topiary camels in the side yard, and thought that was interesting, and a little unusual or unexpected. This was, after all, a mansion. Wondering what the story was behind those, and thinking I will take photos of it later, Steve went to get tickets for us. He exited the mansion with a white pamphlet in his hand, which I began to read. So naturally with the white pamphlet in hand, I was excited that we would be touring his home. What a coincidence – this is something I’m actually very interested in. Guess those Hakon grasses at the entrance were a sign of sorts. Followed by the camels – well, this may be worth doing. So onward we entered, and I couldn’t wait to hear about him and the property. Upon five minutes into the tour guide’s talk, I was confused. Why was she referring to a woman who owned this mansion, and not a man? And who is this woman, by the name of Doris Duke? She obviously was someone rich and famous by the million dollar paintings and art pieces in the house, but was she married to Olmsted, or what? I turned to Steve holding up the white pamphlet and whispered, “I thought this was about Olmsted?” He just shrugged his shoulders, and frowned a little when he heard the tour guide say it would be about an hour or so for the tour. Turns out the fact the outdoor grounds were designed by the “father of landscape architecture and one of the most prolific and renonwed American landscape architects,” was not a major highlight of the tour. It was just a coincidence, a good one for me, because I was now excited for both the tour and grounds to follow on our own. I figured after hearing the tour would take one hour, the best part would be when it was over when I could see the outdoor landscape and gardens, which they noted we could take our time to enjoy. 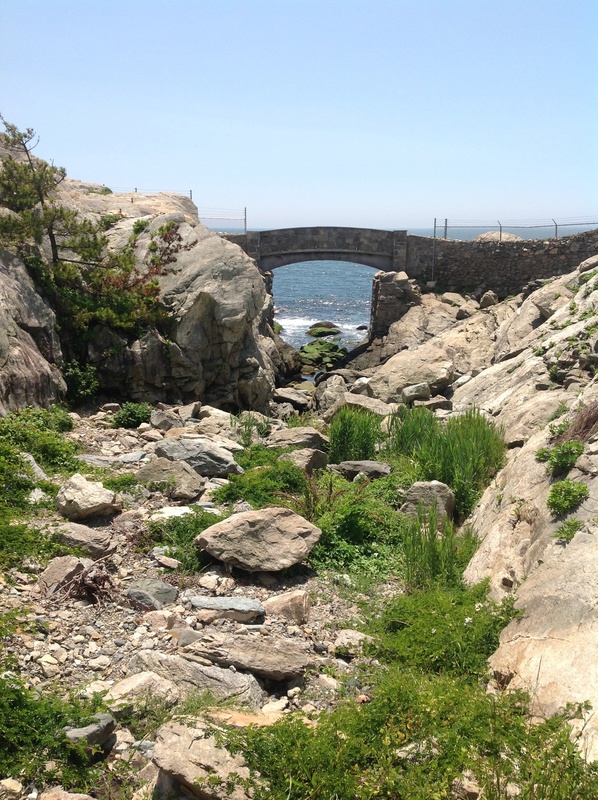 And it gives us access to view the ocean on the mansion side, versus the broken and damaged inaccessible Cliff Walk. As we heard about this woman’s taste in her collections, and about her large dogs allowed to sit on rather valuable furnishings, and about her two camels by the names of Baby and Princess, I was intrigued, and very much interested and enjoying the story of Doris Duke’s life as a philanthropist, world traveler, and collector, while viewing the many treasures in her mansion and home. Doris Duke, it turns out, inherited an estate estimated at $80 million at the age of 12, from her father. Her father was an industrialist, and founder of the Duke Power Company. It was mentioned he also invented the first rolled cigarettes. She was his only daughter. Wow, 12 years old and rich, but not without wisdom as we learned more. She gave so much of her money to worthwhile causes, appreciated art and valued treasures, loved animals, and traveled the world. I was kind of diggin’ this chick more than the vision of seeing Olmsted’s designed property and grounds outside after the inside mansion tour. The whole time during our tour, I fantasized about the kind of life she led, filled with supporting charitable foundations (some in the horticulture scene such as the Orchid Society), and wondered how she and her friends dressed during their social events in the mansion’s grand rooms. But there also seemed to be a tone of loneliness, perhaps, or it was just part of my vivid imagination – but somehow, I sensed she lived somewhat of a solitary life at points. Maybe it was something about how she would swim for an hour by herself in the ocean facing her grand home, or the fact she was married, twice – but both marriages were brief, and also sadly she lost her only child, 24 hours after delivery. Or perhaps it was something about her independence – how she would allow her rather large dogs to sleep on extremely expensive furniture, and have two camels roam the property. To me those were little signs that she was not only elegant but down to earth. I could be wrong, but I wanted to continue my daydreaming as I looked over every piece being well-described by the tour-guide (who I suspected was a teacher in her former life because she asked us questions about history, and other things, kind of like a mini test). Whatever the reason I sensed this air of loneliness about Doris Duke, the home itself was a place I felt was cozy as well as grand. It was filled with amazing carpets and tapestries, furniture, and paintings beyond my artistic knowledge, but the house still had a feeling of a place you could live in without it feeling overwhelming. The rooms were connected in such a way, it wasn’t over powering, and it included a conservatory, which I couldn’t wait to see. Once we arrived to it – the conservatory facing the grand lawn and ocean beyond, we heard a comical story of how the camels, named Baby and Princess, were put into the conservatory during a hurricane one year. Doris had the staff clear out the room and put them in there to protect them. 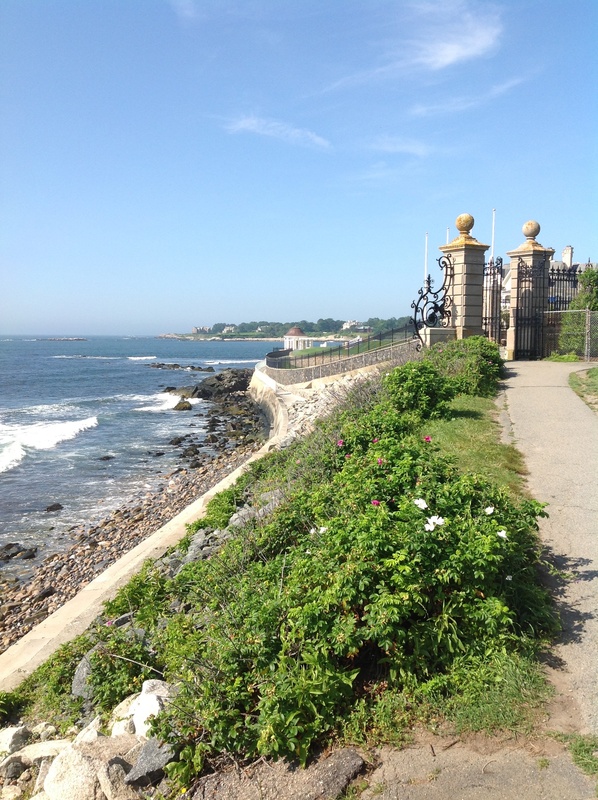 I won’t tell the rest of the story, better to save it for the tour you will attend if you plan to visit Newport, RI. But they did survive, and one camel is still alive today. This was another piece of Doris that made her feel down to earth and not too pretentious. After all – who would let camels into a mansion!?! 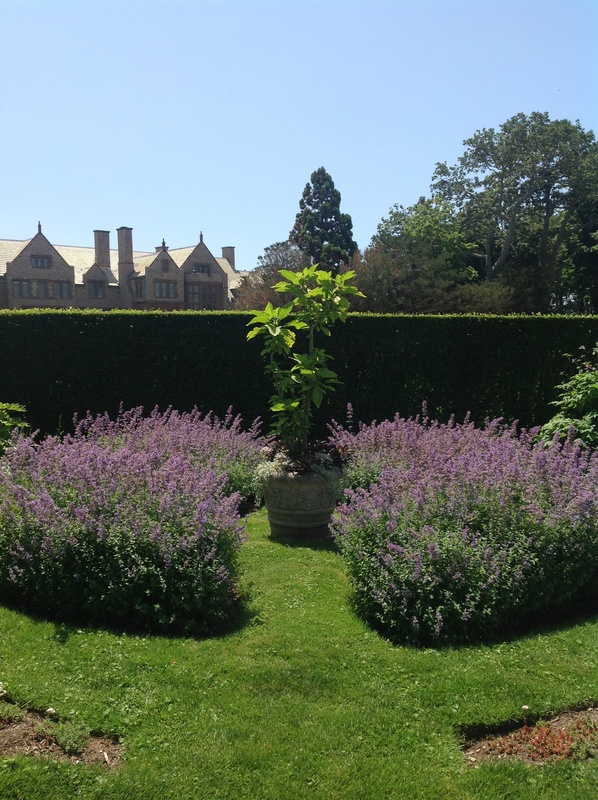 Once our indoor tour was completed, I was eager to visit the secret garden behind the privet hedges briefly mentioned, and the kitchen garden on the opposite side of the 10 acres grounds, which was twice the size when Doris Duke was alive. 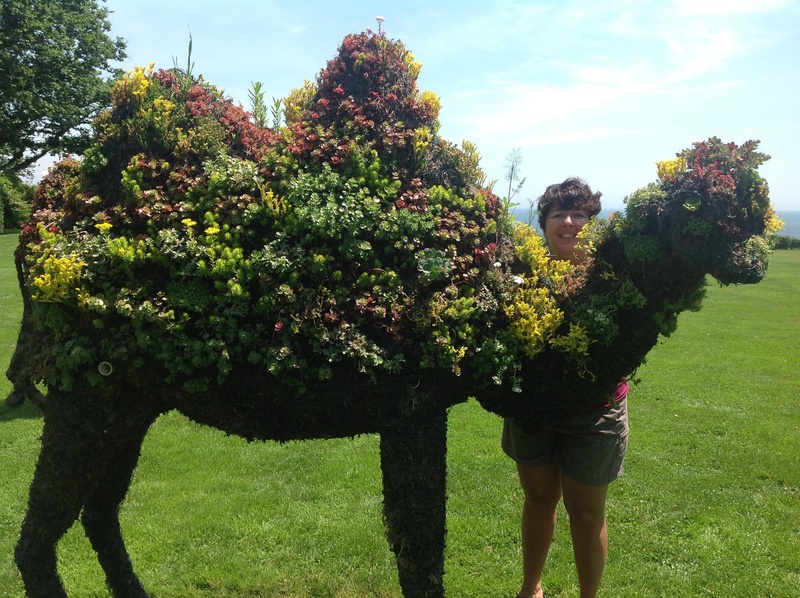 But first was to go see the camel topiary structures in the side yard stuffed with drought-tolerant sedums, succulents, and thymes in honor of Baby and Princess, a gift to Doris Duke from a Middle Eastern businessman, as part of an airplane purchase. Yup, guess the camels make sense now. They were grand enough for a mansion, or perhaps the mansion was grand enough for them. This would depend on your point of view. And the swimming gate where Miss Duke entered the ocean for her daily swims – hard to imagine with the rough waves beyond, or the beautiful stone bridge flanked by rocky outcrops. 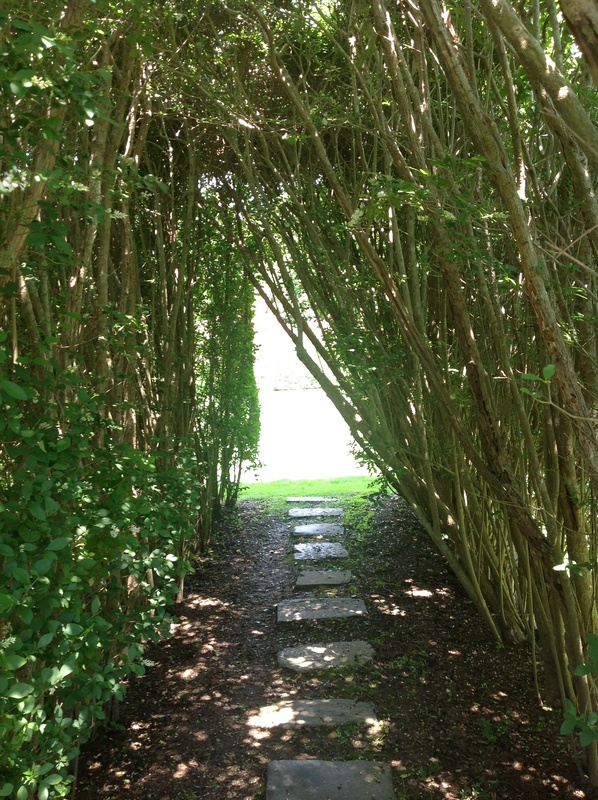 I took off my sandals and enjoyed the soft lush lawn under my feet as I began to walk in awe of the place. Suddendly I realize I wasn’t considering Olmsted at all, and only Doris Duke’s life and vision. She had a big part in many aspects of the outdoor areas as I read more later. 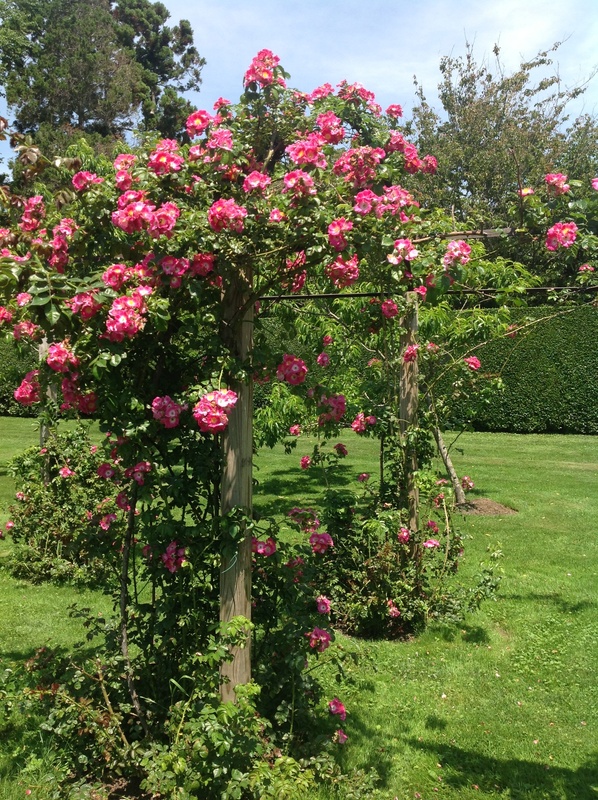 While in the private garden on the property, with a rose arbor was installed and planted at Doris Duke’s direction, planted with ‘American Pillar’ roses, which bloom only once a year, usually around July 4th, which happened to be the weekend of our visit. The area is surrounded by a privet hedge, and flowers and tropical plants are included in the gardens. While it doesn’t stand as it did in the same fashion as when Doris Duke directed the plant list, there was much to be enjoyed. One area surrounded by a hedge of catmint (Nepeta faassenii) with a Brugmansia in a container in the center, was a favorite of mine. 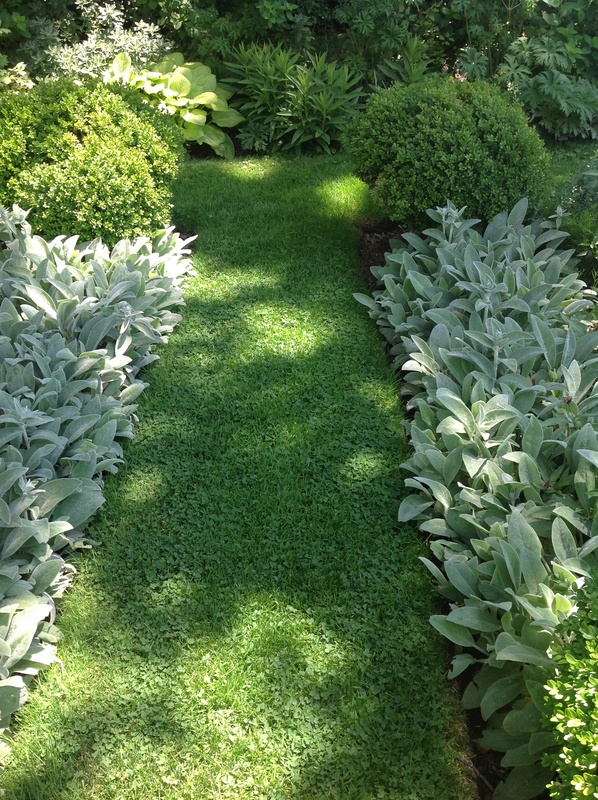 Along with a bed lined with lamb’s ear (Stachys byzantina) and Boxwood. And to see banana plants, most likely the hardy Bajoo’s, made me feel all the more admiration for the property and home. While I suspect it was common to put the gardens tucked away in private areas, part of that made me sad, for you can’t see them unless you go adventure there. 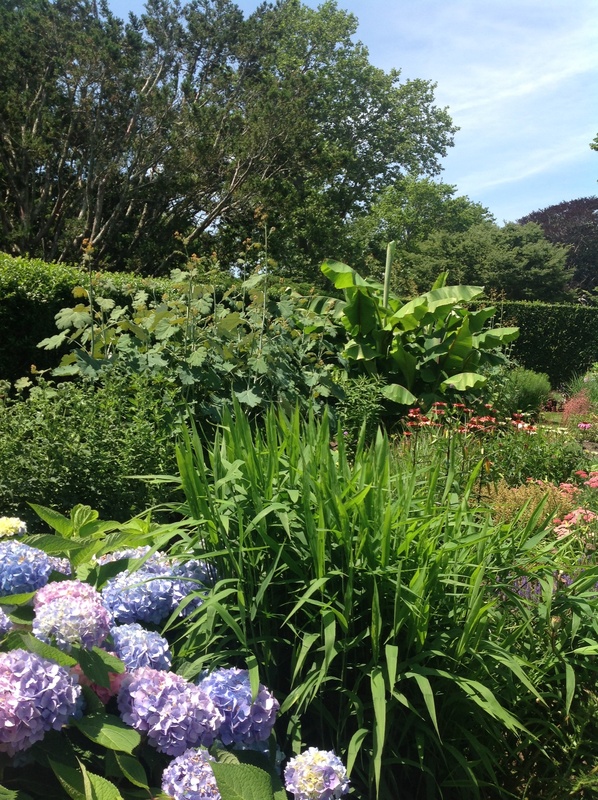 Again, dreaming about how I would put gardens throughout the property, rather than leave a wide open lawn, which by the way is maintained by organic methods. We discovered, as we toured the kitchen garden on the opposite side of the property, cinnamon and clove, are used as an insecticide. A staff person, nameless and camera shy, came by to talk to us and told us this. He said it was part of Miss Duke’s commitment to environmental causes, and the property, all 10 acres, have been maintained using organic practices since 2007. This is truly amazing. Removing my sandals as I walked the lawn areas, it was soft and cozy underfoot, and not one pesty insect was spotted in the kitchen garden as I snapped photos. Our mysterious staff person, dressed in a white chef shirt, took our photo and complimented our chemistry saying he could see we were enjoying touring the grounds. I kind of figured he was also investigating our investigation – this is a place, obviously is filled inside and out with rare and valuable beauty. 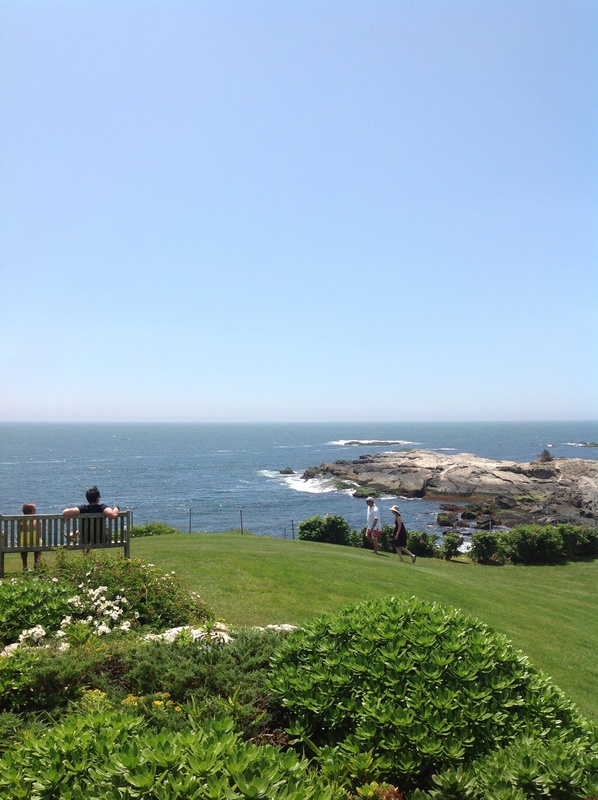 DATES: Check the tour dates of RoughPoint, The Newport Home of Doris Duke. It is closed during the winter season. CAMERA: Bring along your camera – for the outdoor portions. Indoor photos are not allowed. LUNCH: Pack a lunch – as we did, for they don’t limit your time on the grounds, so you can enjoy the view with some snacks. TIME: Give yourself one hour for the indoor tour, and one hour to enjoy and tour the historic grounds. CLIFF WALK ENTRANCE: Enter the Cliff Walk via side street entrances (versus the beginning point). There is one on Webster Street and Narragansett Avenue, shaded and free to park street-side. Or, you can park at the beginning point of the walk, the entrance by the beach off of Memorial Boulevard, but have to walk up a long hill, and in the hot humid sun, we opted for the shaded area starting the walk a bit further along off Narragansette Avenue (connect via Annandale Road). Great blog post, Cathy! 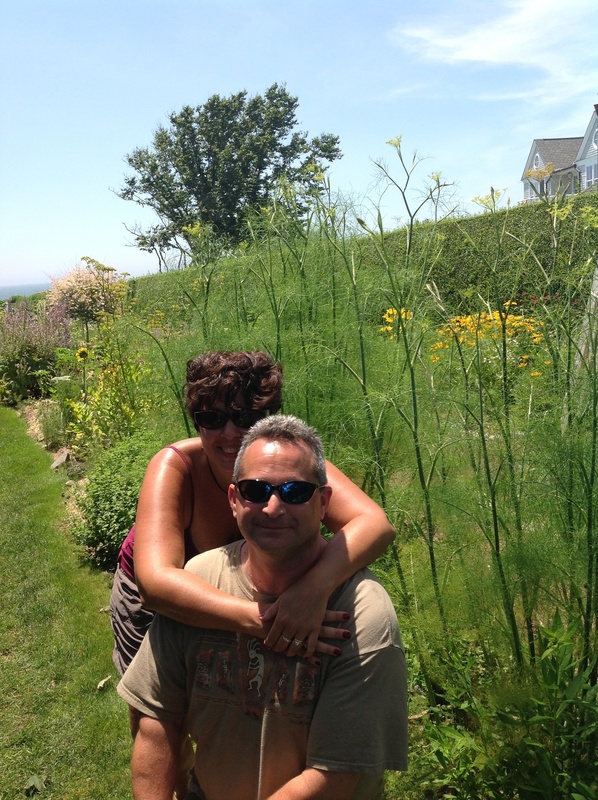 I am one of the gardeners at Rough Point, and I am so glad you enjoyed your visit! I enjoyed this very knowledgeable blog, Cathy, as well as the photos. My grandfather, George Hogan was a professional gardener for the Goelet estate (now part of Salve Regina University) for over 40 years. My father, Frank X. Hogan, was an officer of the National Association of Gardeners for many years. He would have loved meeting you. 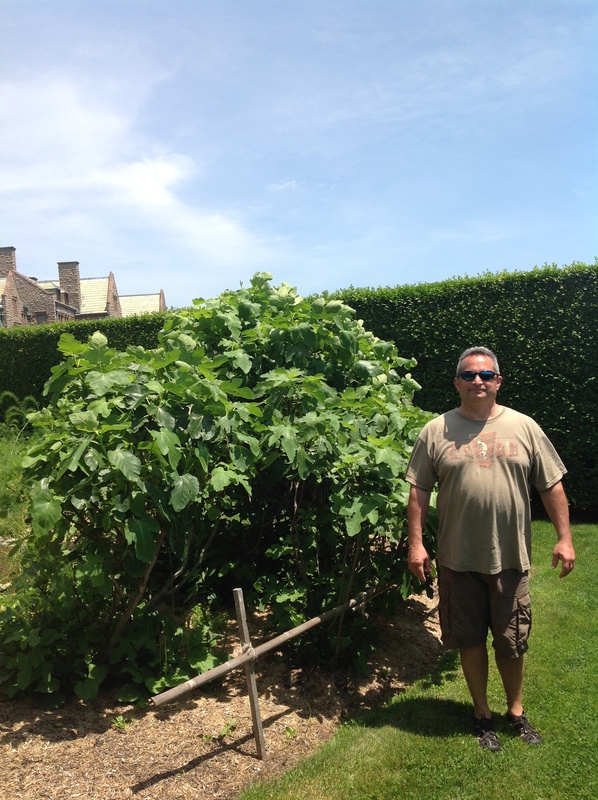 He had an encyclopedic knowledge of plants, flowers and landscaping methods. He owned a great business called Newport Seed, Bulb and Supply which was right next to the Newport Casino, and supplied all the estates on the island and up the coast into Massachusetts.